Today is a special day of remembrance for the Gift of Grace from God. As Christians, this is a day we should keep in remembrance every day of our lives (Give us this day our daily bread, and forgive us our trespasses as we forgive those who trespass against us), but today is specially highlighted as a day of remembrance. Ephesians 2:1-9 (ESV) 1 And you were dead in the trespasses and sins 2 in which you once walked, following the course of this world, following the prince of the power of the air, the spirit that is now at work in the sons of disobedience— 3 among whom we all once lived in the passions of our flesh, carrying out the desires of the body and the mind, and were by nature children of wrath, like the rest of mankind. 4 But God, being rich in mercy, because of the great love with which he loved us, 5 even when we were dead in our trespasses, made us alive together with Christ—by grace you have been saved— 6 and raised us up with him and seated us with him in the heavenly places in Christ Jesus, 7 so that in the coming ages he might show the immeasurable riches of his grace in kindness toward us in Christ Jesus. 8 For by grace you have been saved through faith. And this is not your own doing; it is the gift of God, 9 not a result of works, so that no one may boast. Romans 5:1-11 (ESV) 1 Therefore, since we have been justified by faith, we have peace with God through our Lord Jesus Christ. 2 Through him we have also obtained access by faith into this grace in which we stand, and we rejoice in hope of the glory of God. 3 Not only that, but we rejoice in our sufferings, knowing that suffering produces endurance, 4 and endurance produces character, and character produces hope, 5 and hope does not put us to shame, because God’s love has been poured into our hearts through the Holy Spirit who has been given to us. 6 For while we were still weak, at the right time Christ died for the ungodly. 7 For one will scarcely die for a righteous person—though perhaps for a good person one would dare even to die— 8 but God shows his love for us in that while we were still sinners, Christ died for us. 9 Since, therefore, we have now been justified by his blood, much more shall we be saved by him from the wrath of God. 10 For if while we were enemies we were reconciled to God by the death of his Son, much more, now that we are reconciled, shall we be saved by his life. 11 More than that, we also rejoice in God through our Lord Jesus Christ, through whom we have now received reconciliation. John 14:15-31 (ESV) 15 “If you love me, you will keep my commandments. 16 And I will ask the Father, and he will give you another Helper, to be with you forever, 17 even the Spirit of truth, whom the world cannot receive, because it neither sees him nor knows him. You know him, for he dwells with you and will be in you. 18 “I will not leave you as orphans; I will come to you. 19 Yet a little while and the world will see me no more, but you will see me. Because I live, you also will live. 20 In that day you will know that I am in my Father, and you in me, and I in you. 21 Whoever has my commandments and keeps them, he it is who loves me. 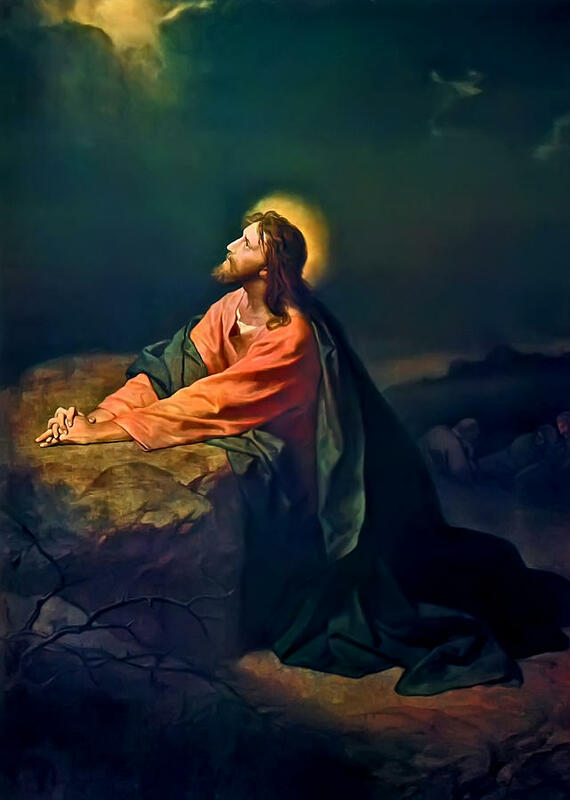 And he who loves me will be loved by my Father, and I will love him and manifest myself to him.” 22 Judas (not Iscariot) said to him, “Lord, how is it that you will manifest yourself to us, and not to the world?” 23 Jesus answered him, “If anyone loves me, he will keep my word, and my Father will love him, and we will come to him and make our home with him. 24 Whoever does not love me does not keep my words. And the word that you hear is not mine but the Father’s who sent me. 25 “These things I have spoken to you while I am still with you. 26 But the Helper, the Holy Spirit, whom the Father will send in my name, he will teach you all things and bring to your remembrance all that I have said to you. 27 Peace I leave with you; my peace I give to you. Not as the world gives do I give to you. Let not your hearts be troubled, neither let them be afraid. 28 You heard me say to you, ‘I am going away, and I will come to you.’ If you loved me, you would have rejoiced, because I am going to the Father, for the Father is greater than I. 29 And now I have told you before it takes place, so that when it does take place you may believe. 30 I will no longer talk much with you, for the ruler of this world is coming. He has no claim on me, 31 but I do as the Father has commanded me, so that the world may know that I love the Father. Rise, let us go from here. John 16:1-14 (ESV) 1 “I have said all these things to you to keep you from falling away. 2 They will put you out of the synagogues. Indeed, the hour is coming when whoever kills you will think he is offering service to God. 3 And they will do these things because they have not known the Father, nor me. 4 But I have said these things to you, that when their hour comes you may remember that I told them to you. “I did not say these things to you from the beginning, because I was with you. 5 But now I am going to him who sent me, and none of you asks me, ‘Where are you going?’ 6 But because I have said these things to you, sorrow has filled your heart. 7 Nevertheless, I tell you the truth: it is to your advantage that I go away, for if I do not go away, the Helper will not come to you. But if I go, I will send him to you. 8 And when he comes, he will convict the world concerning sin and righteousness and judgment: 9 concerning sin, because they do not believe in me; 10 concerning righteousness, because I go to the Father, and you will see me no longer; 11 concerning judgment, because the ruler of this world is judged. 12 “I still have many things to say to you, but you cannot bear them now. 13 When the Spirit of truth comes, he will guide you into all the truth, for he will not speak on his own authority, but whatever he hears he will speak, and he will declare to you the things that are to come. 14 He will glorify me, for he will take what is mine and declare it to you. Matthew 24:29-31 (ESV) 29 “Immediately after the tribulation of those days the sun will be darkened, and the moon will not give its light, and the stars will fall from heaven, and the powers of the heavens will be shaken. 30 Then will appear in heaven the sign of the Son of Man, and then all the tribes of the earth will mourn, and they will see the Son of Man coming on the clouds of heaven with power and great glory. 31 And he will send out his angels with a loud trumpet call, and they will gather his elect from the four winds, from one end of heaven to the other. 1 Thessalonians 4:13-18 (ESV) 13 But we do not want you to be uninformed, brothers, about those who are asleep, that you may not grieve as others do who have no hope. 14 For since we believe that Jesus died and rose again, even so, through Jesus, God will bring with him those who have fallen asleep. 15 For this we declare to you by a word from the Lord, that we who are alive, who are left until the coming of the Lord, will not precede those who have fallen asleep. 16 For the Lord himself will descend from heaven with a cry of command, with the voice of an archangel, and with the sound of the trumpet of God. And the dead in Christ will rise first. 17 Then we who are alive, who are left, will be caught up together with them in the clouds to meet the Lord in the air, and so we will always be with the Lord. 18 Therefore encourage one another with these words. Revelation 19:11-16 (ESV) 11 Then I saw heaven opened, and behold, a white horse! The one sitting on it is called Faithful and True, and in righteousness he judges and makes war. 12 His eyes are like a flame of fire, and on his head are many diadems, and he has a name written that no one knows but himself. 13 He is clothed in a robe dipped in blood, and the name by which he is called is The Word of God. 14 And the armies of heaven, arrayed in fine linen, white and pure, were following him on white horses. 15 From his mouth comes a sharp sword with which to strike down the nations, and he will rule them with a rod of iron. He will tread the winepress of the fury of the wrath of God the Almighty. 16 On his robe and on his thigh he has a name written, King of kings and Lord of lords. Brothers and sisters in Christ, it is my prayer that you find encouragement in this post, and in this Day (the whole weekend) of Remembrance. Encourage one another with these words. Preach the Gospel, and walk in the Grace of God, the Spirit of God, and in Love of God. 1 Thessalonians 5:23-24 (ESV) 23 Now may the God of peace himself sanctify you completely, and may your whole spirit and soul and body be kept blameless at the coming of our Lord Jesus Christ. 24 He who calls you is faithful; he will surely do it.